In reality, “red grape” is not much of a description, but this was the exact description that was given to me when I first purchased this little grape vine a few weeks ago. What you’re looking at in the picture above is its first budding, and not two days later, the first leaf making its way toward the sun. Granted, I am fully aware that grapes are supposed to be grown in long rows, harvested and then made into wine. However, when one lives in a bustling city where grapes are only eaten, and not seen, I figured it was time to bring my own personal vineyard to my doorstep. What I know of this vine’s lineage is that it should, if the picture on the box it came in was correctly labeled, give me a red Spanish grape – most likely a table grape of questionable quality. I also know that soon after it came out of the box, all the buds on it fell off, forcing my roommates to smile politely as I continued to water a dead brown stick. Today, as I so proudly look upon my little vine, I turn to my roomates with my tongue stuck while making “thbbbtss” sounds rightiously saying, “I TOLD YOU SO!” at their obvious lack of faith. 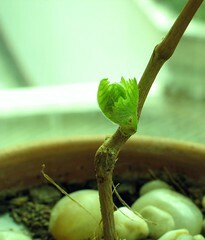 In all honesty, why am I wasting my time with my pathetic efforts at raising a vine in a pot? Simply put, I have never lived near enough to a vineyard to see the process that a vine goes through as it turns from a gnarled piece of wood into a draping curtain of leaves. Nor have I followed its progress from the setting of small pre-mature grapes to deep juicy purple grapes. Obviously, just by reading this site, you are well aware that I have seen the process of a vine from start to finish throughout my travels, but that just doesn’t satisfy my curiosity to see the whole picture. In fact, I’m willing to bet there are a few wine lovers out there who are also wondering what this process looks like as well. Hence, here is my proposal: from this month onwards, I will post an updated photo of the vine once a week, or twice a month if merited, so that we can all watch it as it grows. Due to it’s unknown lineage we won’t know if it’s maturing according to schedule (every varietal has it’s own aging curve), and due to it’s youth, we run the chance of not seeing mature grapes this year. This isn’t necessarily a bad thing, but merely something to store in the back of our brains as we take note of its development over the next year. Hopefully it will follow to some extent the growing season of the DO’s Madrid and LaMancha, close neighbors to the inner city in which I live. Thus giving us a feel for where the vines that sit outside Madrid proper are in their aging process. 1)Calling this vine “vine” is going to get pretty boring, not to mention confusing if I happen to find another. So I propose a contest…..NAME THAT VINE! Send in your ideas for a name to – contest (at) catavino dot net. In two weeks, we’ll pick our favorite name from the entries sent in and the winner will receive a prize. It will be something from Spain having to do with food or wine and able to be shipped anywhere in the world. 2)Although I have several plants, this by no means suggests that I know what I’m doing with them. Advice, ideas, suggestions, and anything else one might lend to my project is welcomed. For example, it would be wonderful to know when I should water, when to fertilize, etc. 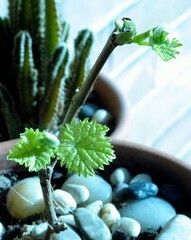 Most likely, this is a pretty boring table grape, so please use that as your general rule of thumb. Oh and for all of you green thumbs out there, I realize that I might not get much in the way of grapes this first year but it still could be fun to follow! 3)Because vines do better in pairs, I’m looking for someone who can get my vine a friend, but not just any friend, a vine from Iberia. Unfortunately, I haven’t as of yet found a native vine that I can purchase, and haven’t yet asked a vineyard if they could lend me hand. Therefore, I am spreading the word to see if I can score a vine of Tempranillo, Granacha or Monstrell. I would prefer a red grape so that we can see veraison happen, but any grape will do! Let me know if you have an idea! So that’s about it! Let’s see what happens and let me know if you have any suggestions along the way.